Reflections after each section to guide your work. Choice: Despite high motivation to be involved, the decisions “to change diapers, give baths, to turn off the TV and play with the kids, to come home a few minutes earlier than usual from work, or to read the same story every night” involves making active choices on a regular basis. Support: A network of supports including parents, their partner’s parents, peers, and social services they can access help fathers to become more involved with their families. Gender: Non-heterosexual fathers often face invisibility in programs. “A consistent hook for fathers is talking with them about the kind of adult they want their child to become. Fathers appreciate the idea of legacy.” It recommends telling fathers about the research that shows their positive involvement can have positive impact on a number of aspects of child development, including cognitive, emotional, social development and physical health. An over-zealous welcome – Men don’t want to be put on the spot or centered out. Timing: There are exceptions, but evenings and weekends usually work best for dads’ programs. “Success in engaging fathers requires being strategic, methodical, welcoming and relevant.” This section offers a wide range of practical suggestions in each of these areas. Hear men out. Find out their interests. Do more facilitation of discussions than teaching of content. Be prepared for some men to challenge your role in this work from time to time. Keep discussions solution-focused, rather than idea or sharing focused. Promote the message that dads can go to parent meetings, field trips, and volunteer at schools. Start with the assumption that dad is important to his family and really wants to be part of the group. Try to make icebreakers activity-based and relevant to the topic at hand. Do not openly challenge a man to respond in front of the class. There is a danger in thinking too much about how men and women are different. This can lead to condescending behavior and change the focus of the group. Men like to be direct and to the point. Allow the men to be the experts of their lives and families. Be patient, and curious about what they have to say. Learn from your learners. Providing parenting groups for fathers. Using the internet to share information and provide quality resources for dads. “In general, fathers want to be playing and teaching in very active and concrete ways. Activities can be the doorway fathers use to enter a program.” Many activity-based programs require good connections with community partners. Ask a few dads to walk through the centre, office or waiting room to identify attractive or unattractive features, and make use of suggestions that fit the overall purpose of the centre. If a dad misses a scheduled event, a phone call or quick email is a nice touch that is rarely rejected. Offer classes and programs in places like libraries, schools, religious centres, or even local restaurants. These may be more accessible to fathers who may be uncomfortable with going to an agency or centre. Access: Consider ways to help men get to programs (e.g. bus tickets or pick up). Goal oriented: use charts, pictures and examples to make information practical and accessible. Timely information: the impending and/or recent birth of a child and other transition points include the toddler stage and heading off to school. Teaching their child: “Fathers are often focused on their children’s ability (potential) to be ready for school. Engage father through literacy, numeracy, and science activities.” Offer charts, graphs, videos, pictures and printed follow-up activities to take home. A Word of Caution: Avoid intentional discussions about occupations in the group. 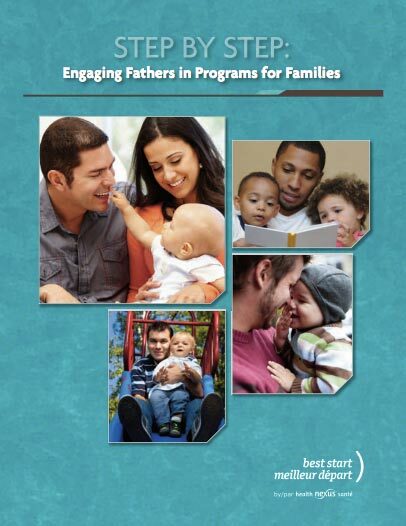 In the Reflections section, the guide offers a checklist of potential strategies for program staff to reach fathers. There are many community partners who can help spread the word (e.g. local stores, religious centres, doctors’ offices and other medical services, local sports complexes, arenas, community centres, gyms and clubs. The program values the role of mothers. The program has staff time dedicated to engaging fathers. The program is consistently providing training opportunities for staff to keep up-to-date on new resources, ideas, and innovation in working with fathers. The program recognizes and responds to the diversity of fathers. The program creates a father-friendly atmosphere. The program forges partnerships with other community agencies. The program does regular self-reflection work on their work with fathers, highlighting successes and adjusting to barriers as they come along. Will one parent be a stay-at-home parent? Will the parental leave be shared? How flexible are their employers with medical appointments and emergencies? Does work provide for drug plans, dental and life insurance? Is their life insurance up to date and adequate? The manual offers a range of suggestions service providers can offer to encourage fathers to plan an active role in the pregnancy. Dads are helped by being made aware of postpartum mood disorders (PPMD), affecting about 25% of families. Ideally this information can be made available during pregnancy. The guide gives a range of suggestions to encourage dads in supporting their partner.